The program is basically focused for the school children. The main objective of this education volunteer program abroad in Nepal is to help improve the English skills of some of the most disadvantaged children of Nepal. The program could be the best practice of Cultural Exchange/Immersion for both high School Students and young university Students. 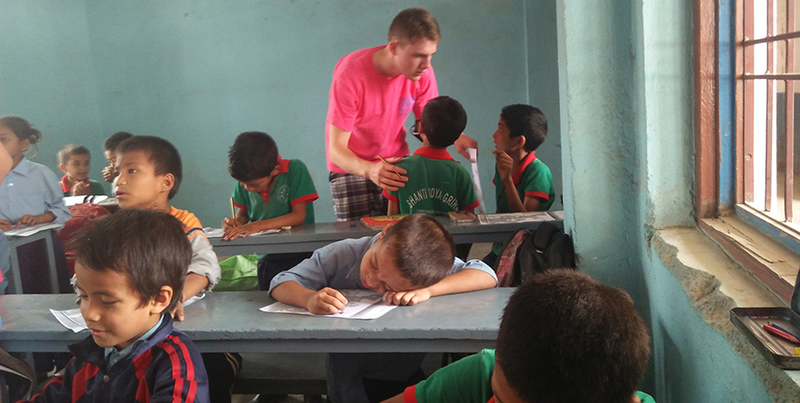 As a teaching volunteer in Nepal, you will share your English skills with the children. You will also organize various entertaining extra- curricular activities, including singing classes, music classes and so on. Volunteers will also organize hygiene practice awareness classes for young girls. You will teach the girls about how to keep one healthy while facing different types of health issues. You will stay with a host family and work with different groups to handle students of diverse backgrounds. Volunteers are allowed and encouraged creating the entertaining program if interested. You can get the students involved in art and craft preparation. However, needed materials for these programs may not be available. Therefore, you need to arrange yourself. Upon your arrival to join Nepal volunteer program, you will be picked up at the airport and transfer to your placement. An orientation program will be arranged after your arrival. You will be briefed about the program, Nepalese cultures, traditions, dress-code and most importantly, your roles and responsibilities while staying in Nepal for volunteering.